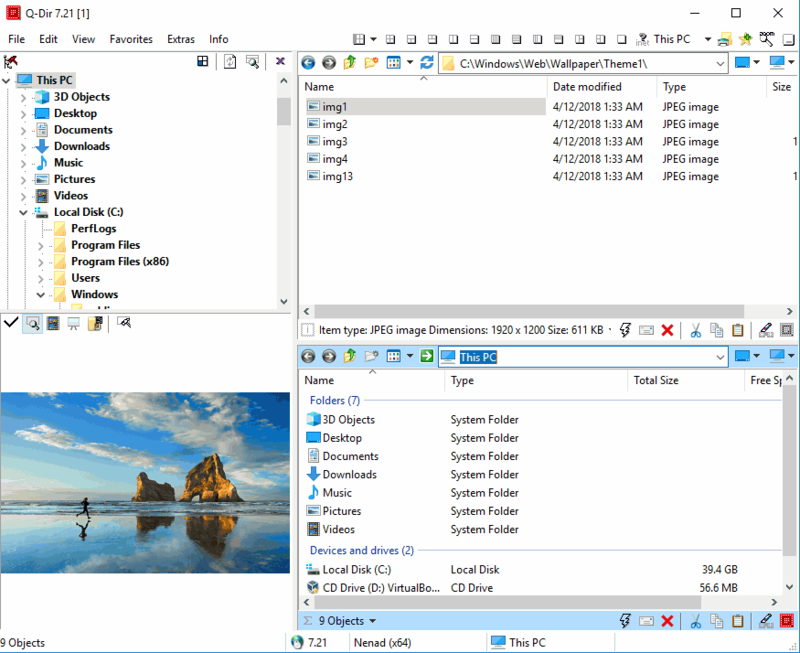 Q-Dir is a quad-pane file explorer that supports favorites, file/color filtering, export to XLS/CSV/TXT/HTML, screen magnifier, quick preview etc. Alternately, Q-Dir Portable at PortableApps.com automatically switches between 32/64-bit and is approved by the publisher. How to extract: Download the "Portable" ZIP package and extract to a folder of your choice. Launch Q-Dir.exe or Q-Dir_x64.exe (for64-bit OS). Well, i found the solution myself. Don't know if this option is new or not but its the first time i noticed. So, when dragging files into another window or tab in Q-dir, at the bottom it says "Start drop in new process"! (and recycle bin and email aswell) ha! and just drop it on this button.. nothing will freez! magic :) Thanks anyway folks. The Q-Dir 64 installer 6.47 is not installing, last time there was also a problem with the 64 installer. They should be checking first before releasing the installer. Can't recommend Q-Dir to anyone, freezes while copying, Q-Dir windows turns black, crashes. Windows 10 64-Bit, tried Q-Dir 32-Bit & 64-Bit, tried the PortableApps version, all of them buggy as hell. That*s probably the reason why the developer frequently updates it. 2 years back Mithril wrote about something that's still happening. Time to start looking for an alternative, till then i'll use Windows Explorer. IsMyLcdOK checks for dead/paralysed/stuck pixels on LCD monitors. calibre is an e-book library management application with a variety of useful functions including device-specific e-book conversion, news download and conversion, viewer and content server for online access to your collection. The program syncs automatically with many different physical devices. It supports a variety of e-book formats, as well as e-books contained in RAR and ZIP archives. Cross-platform with clients available for Mac and Linux. Alternatively, X-calibre is stealth and automatically adjusts paths. A WinXP-compatible version is available. How to extract: Download the "portable installer" and extract to a folder of your choice. Launch calibre-portable.exe. Calibre is "huge" (maybe it have to be like that, it's not a criticism, it's just a pity! ), and I too don't like at all its way to make its own library (I have to put there only books I want to convert, and remove them, not a user friendly behaviour). It's a little too complicated, but it does its job well! Per CALIBRE Version: 2.33.0 beyond version 1.48x CALIBRE no longer supports XP. 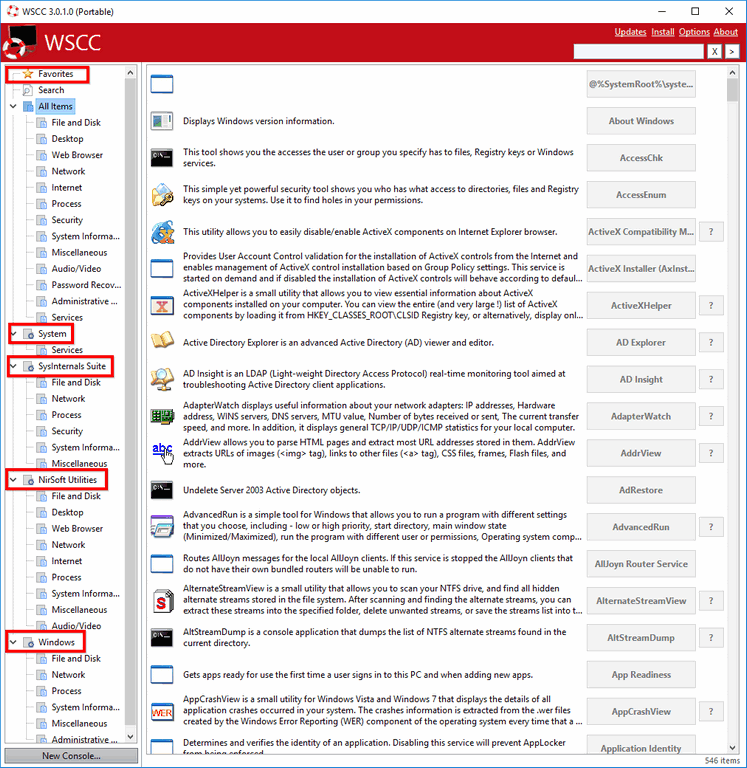 Windows System Control Center (WSCC) allows you to install, update, execute and organize the utilities from various system utility suites. The program either works as an interface or as downloader. The program can work with both utilities suites downloaded or can dynamically grab and run the programs via a web connection. The included Update Manager can check for newer versions of the utilities already installed and can download and install the missing items. Works with Windows Sysinternals and NirSoft Utilities suites, but also highlights Windows' own utilities. Note: The setup packages are downloaded from the author's website. How to extract: Download the "Portable" ZIP package and extract to a folder of your choice. Launch wscc.exe. Download may fail in the 64-bit edition. The download page shows 2.5.1.0 as the freeware version, 3.0.0.0 appears to be the payware version. Inviska Rename is a flexible, feature-rich and easy-to-use file rename tool that can give meaningful names to groups of files and folders. The program can be used for renaming music files from tags, replacing photograph names with more useful names, renaming photos from Exif tags and more. The program supports Unicode and offers a wide list of renaming methods, automatic preview and undo. Cross-platform with Linux and MacOS versions available. How to extract: Download the "Portable" 7z package and extract to a folder of your choice. Launch InviskaRename.exe. Website down, if it doesn't come back online I can provide downloads for all Inviska Rename versions I have. Website still down, linking to Softpedia. Similarities with Lupas Rename are obvious. And this is good. But the website has been down for too long. And that's bad.